SAVANNAH, Ga. – The U.S. Army Corps of Engineers Savannah District announces the closure of one lane on Highway 221 at the J. Strom Thurmond Dam (Clarks Hill, S.C.) while a repair project is underway on the dam’s spillway gates. The repair project is scheduled to begin on Jan. 14 and may take up to two years to complete. Workers will inspect and make repairs to 20 of the 23 spillway gates at the dam as required by the Corps’ dam safety program. The Corps coordinated the lane closure with the Georgia and South Carolina Departments of Transportation. Traffic lights and warning signs will be in place during the road closure to ensure the safety of contract employees and motorists along this stretch of Highway 221. The lane closure will be included in Georgia’s travel advisory notifications. Unlike previous repair contracts at the dam, this project should not affect lake levels. 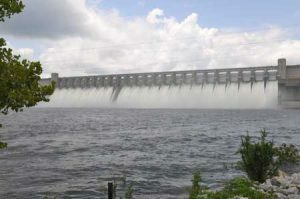 “We have not planned any specific actions to maintain lower lake levels to accommodate the work,” said Scott Hyatt, operations project manager for J. Strom Thurmond Lake. From 2010 to 2012, contractors with the Corps repaired the lifting arms and applied a new protective coating on the spillway gates as part of an American Reinvestment and Recovery Act contract, which resulted in a similar lane closure on Highway 221, Hyatt said. During that project, the Corps was required to maintain the lake level at least two feet below full pool (328 feet per mean sea level) to ensure workers’ safety. “During that contract, we identified additional work that needed to be done to repair the metal surface plates of the gates,” Hyatt said. The Corps awarded the current $2.6 million contract to Construction Services Group of Charleston, S.C., in September 2013. The contractor plans to enlist the help of local sub-contractors, including Augusta Industrial Coatings, Hyatt said. “These repairs will ensure that we maintain adequate strength and serviceability of the dam,” Hyatt said. The spillway gates, also referred to as tainter gates, are used for the quick release of water from the lake during flood control operations. With all 23 gates completely opened, water can be released at a rate of 1 million cubic feet per second. For more information, please contact the Corps’ Thurmond Lake Project Office toll free at 1-800-533-3478 ext. 1147.